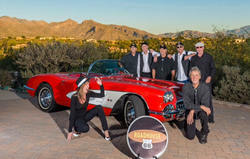 ROADHOUSE IS A POPULAR WELL-ESTABLISHED TUCSON BAND WHOSE MEMBERS HAVE BEEN TOGETHER FOR OVER TWENTY YEARS. THIS GROUP COMES WITH A SUREFIRE GUARANTEE TO GET EVERYONE MOVIN' AND GROOVIN' TO SOME FINE DANCE MUSIC. LEAD SINGERS FRANK AND DEBBIE, BLEND THEIR VOCALS WITH THE GUITARS OF CHRIS AND DARRELL, PAT'S KEYBOARDS, JOE'S HARMONICA AND RALPH'S BACKBEAT. TOGETHER THESE SEASONED MUSICIANS DELIVER A VARIETY OF TUNES RANGING FROM ROCK TO COUNTRY TO BLUES SPICED UP WITH AN OCCASIONAL DASH OF ZYDECO. ROADHOUSE IS SURE TO PROVIDE AN EVENING OF ENJOYABLE FOOT-STOMPING MUSIC FOR YOUR LISTENING AND DANCING PLEASURE. We love what we do and it shows! Come on out and see us, and bring your dancing shoes! Take a look at our upcoming events. If you have pictures of our past events, we would love to post them on the site. See you on the dance floor! Check Out Where We Will Be Next!! Click Here. Contact Us! To book us for your next private or business event!